JACKSONVILLE, Fla. — Getting into a shopper’s cart is quite possibly the most important step for every product, but it’s becoming more difficult when the options are nearly endless for shoppers when it comes to what, where and how to buy. 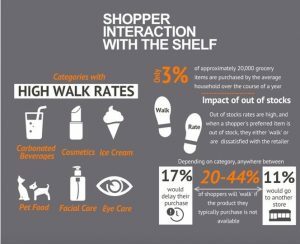 Shelf Management: The Value of Space Done Right, a new report from Acosta — a leading full-service sales and marketing agency in the consumer packaged goods industry — explores the dynamics of this topic and explains why and how to employ a comprehensive strategy. Manufacturers spend $100 billion annually on promotions versus $300 million on shelf management, yet shelf management represents 66% of sales and 85% of profits. While the industry has experienced a decline in lift from promotional tactics over the past several years, “fixing the shelf” achieves a six percent sales lift. Fifty-five percent of shoppers decide which brand to buy in-store, with common in-store purchasing decisions made about spices/seasonings, cookies, meat marinades/rubs, chocolate candy and tuna. Private brands tend to receive more shelf space than they deserve and are 11% over-spaced on average, which can have a negative impact on productivity and out-of-stocks. As the perimeter of the store continues to gain in popularity, many retailers have responded by decreasing the size of center store to give more space for areas such as delis, prepared foods, organic foods and fresh produce. Retailers have reacted to the rise of e-commerce in several ways, including offering grocery pick-up services and offering less assortment in-store and an expanded assortment online. Virtual shopping research tracks shopper responses to a digitally-created shopping experience to find the optimal balance between speed, cost and accuracy. Simulated eye tracking predicts what shoppers will see in the first three to five seconds of shopping and can influence what the shopper ultimately purchases from the shelf. Trax technology captures everything a shopper would see in-store, then digitizes shelf images down to the SKU level to minimize out-of-stocks (estimated at $54 billion in lost sales), ensure effective in-store execution/pricing and see what competitors are doing at the shelf. Acosta’s 2018 Shelf Management: The Value of Space Done Right report was compiled from a variety of Acosta’s resources including an online survey of the company’s proprietary shopper community. To access the full report, visit www.acosta.com/news.